The holidays are fast approaching, and for many of us, the best part of this time of year is gathering around the table to share a festive meal with our family and friends. So much of this season revolves around mealtime, and setting a beautiful table promotes warmth and hospitality at our annual gatherings, conveying a message to our guests about how much we value them. Whether it’s a casual family dinner or a formal event, the holidays are a prime opportunity to cultivate your personal style. 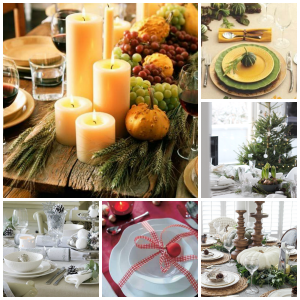 This month we explore some fun and creative ideas for arranging your holiday table with maximum style and minimal stress. MIX AND MATCH: The simplicity of an all-white tablescape can be both effective and breathtaking. But consider the eclectic feel of a mix-and-match approach. Varying your dinner plates, salad bowls, and goblets with an assortment of patterns and colors creates an eye-catching view. Use a paisley tablecloth with striped napkins, or allow polka dots and florals to play off of each other, always making sure your colors are complementary. It’s best to utilize one dominant color with secondary colors used as accents, whether in your linens or plating, in order to keep a coherent flow. GO NATURAL: Visit the produce section of your grocery store for inexpensive and colorful ways to decorate your table. A bag of cranberries poured into a glass bowl of water makes a great setting for floating tea lights or star-shaped candles. Stud oranges or apples with cloves to create a colorful and fragrant centerpiece. A wooden trencher filled with fruit and nuts, which can be eaten later, is appropriate for Thanksgiving or Christmas. Lemons, artichokes, and pomegranates can also be mixed with greens for a beautiful focal point. KEEP IT CENTERED: Candles add a soft ambiance to your centerpiece, whether tapers in matching candlesticks or large pillars placed in glass containers. Lean on nature for inspiration, using leaves, pumpkins, pinecones, or greenery arranged directly on the table or in beautiful containers found in your cupboards. A touch of white or gold spray paint can easily be applied to natural items or to bottles and vases to help solidify your color scheme. With minimal expense or effort, you can create centerpieces that evolve from season to season. MAKE IT PERSONAL: Nametags let people know you were anticipating their individual attendance. And if you are mixing friends in with family members, nametags help you arrange the seating in a way that promotes conversation and prevents anyone from feeling isolated or uncomfortable. A small pumpkin or large pinecone centered on each plate makes a great nametag base. An individualized Christmas cookie serves dual purposes for both identification and eating, or consider a small ornament monogrammed with each guest’s initials. DO THE UNEXPECTED: There are no rules when it comes to setting a beautiful table, so consider how you can get creative with unexpected touches. Mix pieces of your grandma’s old china with your own modern place settings. Arrange the silverware in a cluster on top of each plate and tie it with a ribbon. Use pieces of antique sheet music as individual placemats. Foregoing a tablecloth can expose the beauty of the natural wood of your table. THINK AHEAD: It’s never too early to start planning for next year. Scour those after-the-holidays clearance racks for themed napkins, plates, or linens. Keep your eyes open at Goodwill and other thrift shops for Christmas plates or red goblets. Using your mom’s snowflake glasses only on Christmas Eve gives your family something to anticipate and sets holiday meals apart from your everyday dining experiences. Collect gold candlesticks, glass jars, or pewter plates, all of which can all be used for centerpieces. The folks around your table will undoubtedly be your greatest gifts this holiday season. Taking time to create a beautiful environment is one way to show them how much they matter. Enjoy the holiday season with those you love!